This place is the best location we have ever stayed! We walked to the Plaza- shopping & restaurants, to Canyon Road- art alley. 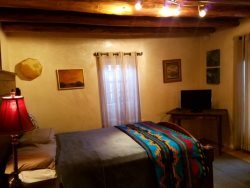 We had easy access to grocery stores- Albertsons, Whole Foods and the freeway access was just down the road for day trips to Chimayo and Bandolier Natl Park. The pub grub two doors down: Fire & Hops was excellent and easy after a long day of exploring. Germaine was phone accessible while in town for any questions during our stay. Very quiet for sleeping and napping!